the compounds with the RNase H active site. erodimer composed of two peptide subunits, p66 and p51. 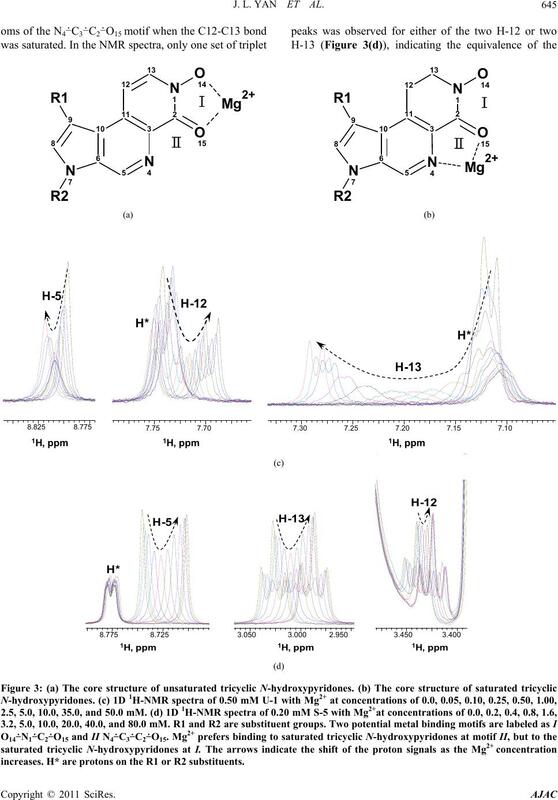 confirmed by calorimetry and NMR, respectively [9,11]. J. L. YAN ET AL. Bh-RNase HC-substrate complexes by Nowotny et al. 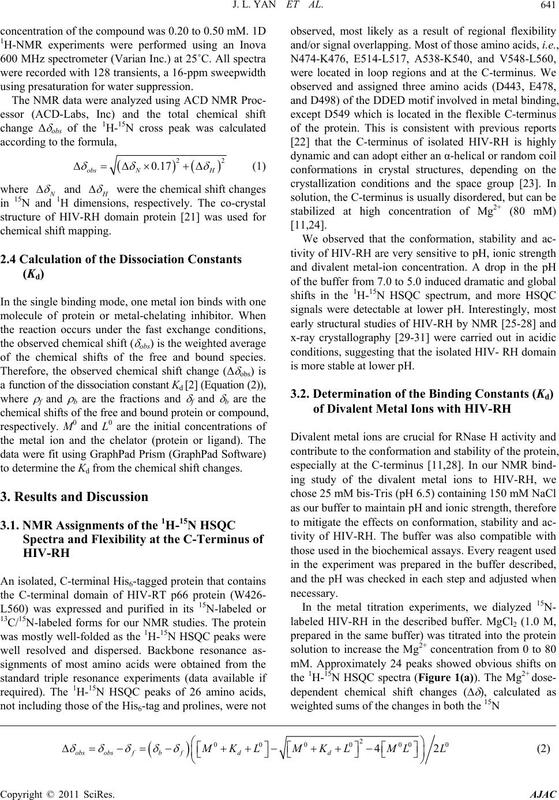 supported the two-metal-ion catalytic mechanism [6,13]. 15˚C - 18˚C for 16 hours and harvested by centrifugation. processing and SPARKY for sequential analysis . 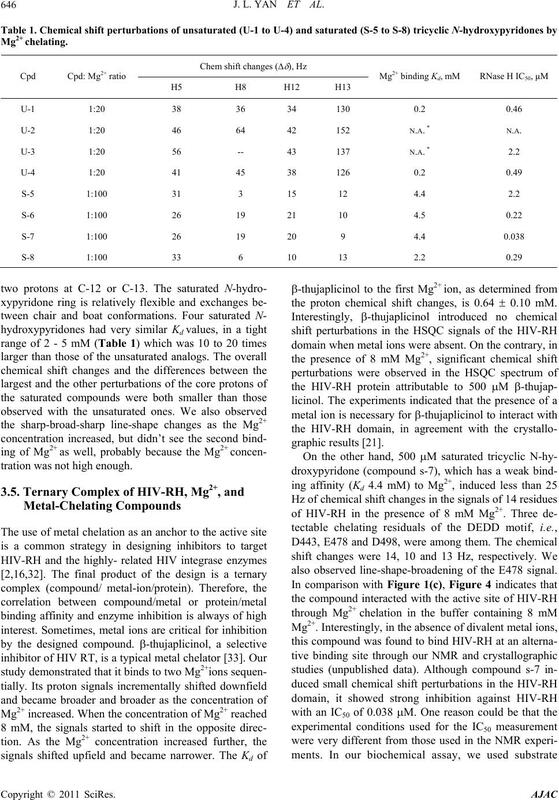 cal shift changes as the metal ion concentrations increased. using presaturation for water suppression. is more stable at lower pH. of the chemical shifts of the free and bound species. to determine the Kd from the chemical shift changes. (purple), 2.5 mM (pink), 5 mM (cyan), and 10 mM (blue). HIV-RH is four times tighter than that of Mg2+. spectra in the presence of 80 mM Mg2+ or 15 mM Ca2+. the flexibility of the C-terminus, where D549 is located. G444 and broadening for E478 and G453 at 80 mM Mg2+. 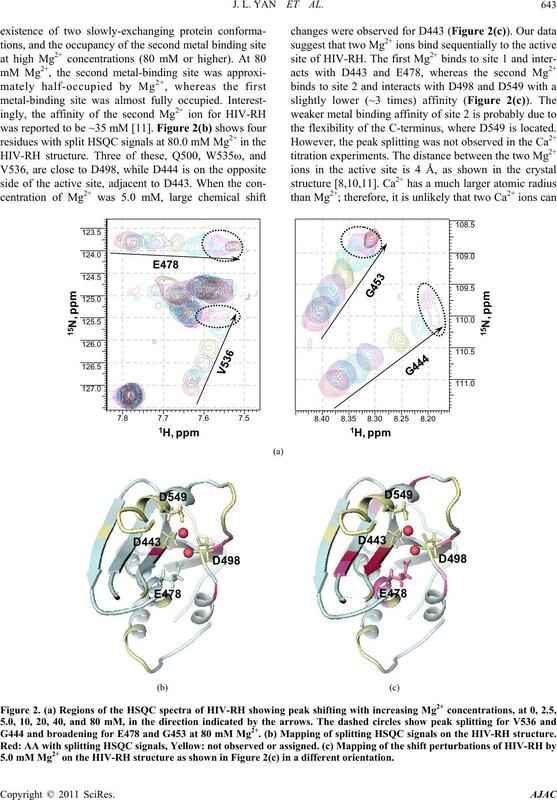 (b) Mapping of splitting HSQC signals on the HIV-RH structure. Mg2+ ion through curve fitting. which were located in the R1 and R2 substitute groups. H-13 is the proton nearest to the Mg2+ ion (Figure 3(a)). 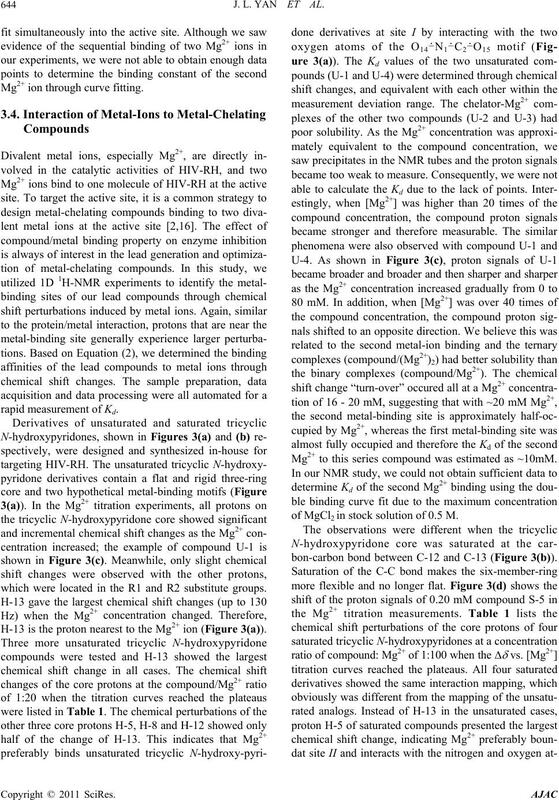 Mg2+ to this series compound was estimated as ~10mM. 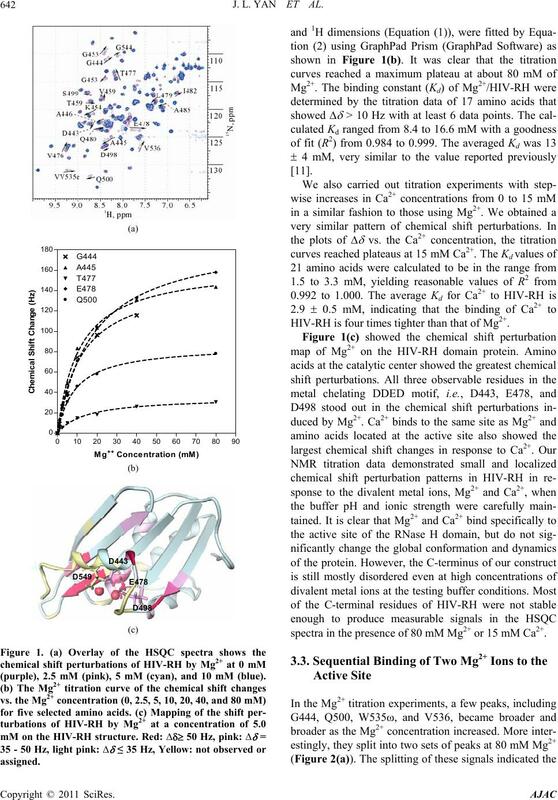 of MgCl2 in stock solution of 0.5 M.
bon-carbon bond between C-12 and C-13 (Figure 3(b) ). increases. H* are protons on the R1 or R2 substituents. U-2 1:20 46 64 42 152 N.A. N.A. tration was not high enough. the proton chemical shift changes, is 0.64  0.10 mM. also observed line-shape-broadening of the E478 signal. pyridones are weak, with Kd values in the mM range. pyridone compounds range from 2.2 μM to 0.038 μM. compound to the active site of HIV-RH specifically. tions between the compound and the protein instead. tein/compound interaction is practically more efficient. duced the metal-binding affinity from 0.2 to 4.0 mM. compounds were much higher, from 2.2 μM to 0.038 μM. and Molecular Biology, Vol. 58, 1997, pp. 339-393.
cleic Acids Research, Vol. 34, No. 1, 2006, pp. 42-52.
e Therapy, Vol. 2, 2004, pp. 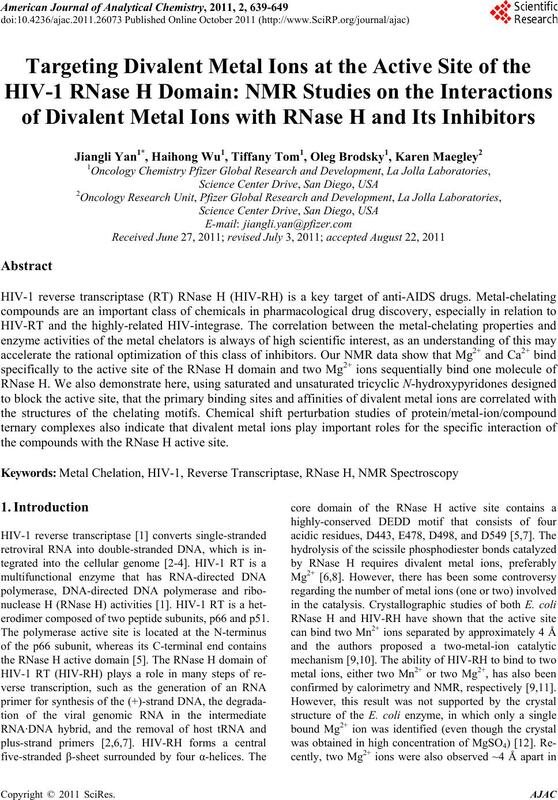 RNA/DNA,” EMBO Journal, Vol. 14, No. 4, 1995, pp. Specificity,” Molecular Cell, Vol. 22, No. 1, 2006, pp. talysis,” Cell, Vol. 121, No. 7, 2005, pp. 1005-1016.
organic Chemistry, Vol. 5, No. 1, 2000, pp. 67-74. Vol. 42, No. 3, 2003, pp. 639-650. 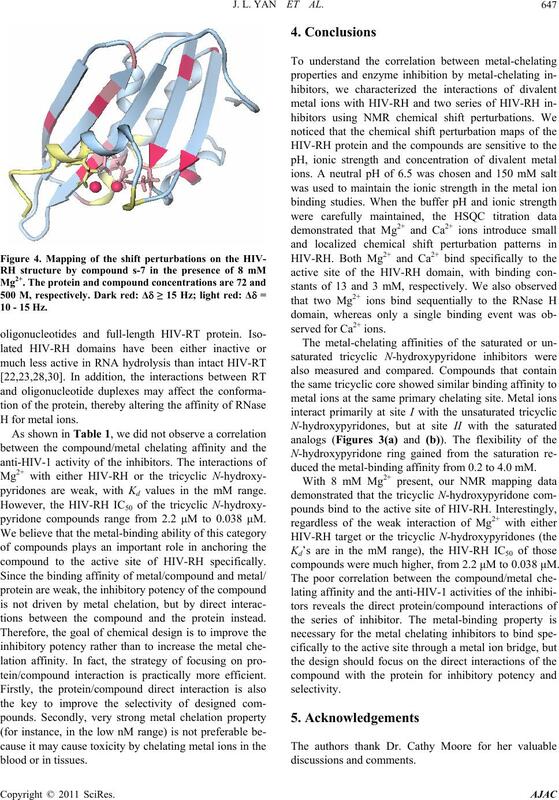 Mg(2+)-Binding Site,” Proteins, Vol. 17, No. 4, 1993, pp. tion,” Molecular Cell, Vol. 28, No. 2, 2007, pp. 264-276.
Letters, Vol. 257, No. 2, 1989, pp. 311-314. Reverse Transcriptase,” The EMBO Journal, Vol. 10, No. in Medicinal Chemistry, Vol. 6, No. 6, 2006, pp. 727-737. 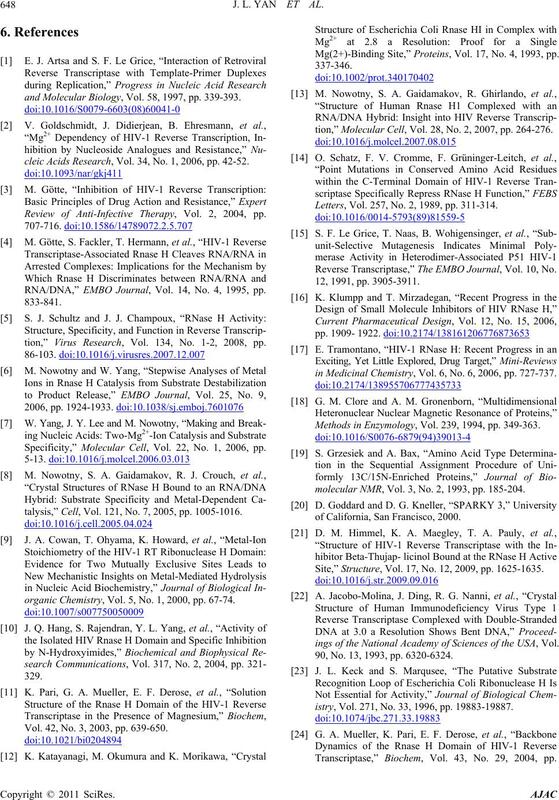 Methods in Enzymology, Vol. 239, 1994, pp. 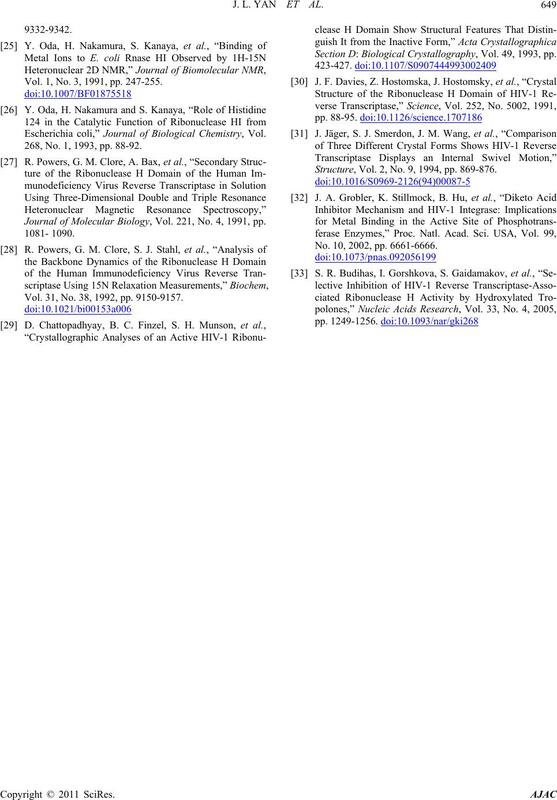 349-363.
molecular NMR, Vol. 3, No. 2, 1993, pp. 185-204.
of California, San Francisco, 2000. Site,” Structure, Vol. 17, No. 12, 2009, pp. 1625-1635.
ings of the National Academy of Sciences of the USA, Vol. 90, No. 13, 1993, pp. 6320-6324.
istry, Vol. 271, No. 33, 1996, pp. 19883-19887.
. 43, No. 29, 2004, pp. Vol. 1, No. 3, 1991, pp. 247-255. 268, No. 1, 1993, pp. 88-92. 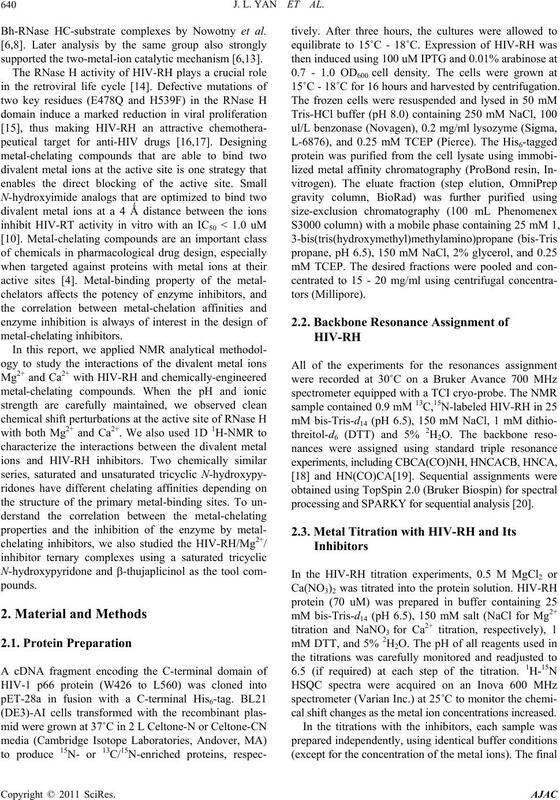 Journal of Molecular Biology, Vol. 221, No. 4, 1991, pp. Vol. 31, No. 38, 1992, pp. 9150-9157. Section D: Biological Crystallography, Vol. 49, 1993, pp. Structure, Vol. 2, No. 9, 1994, pp. 869-876. No. 10, 2002, pp. 6661-6666. S. R. Budihas, I. Gorshkova, S.